The Villanova Wildcats returned home for a championship celebration. 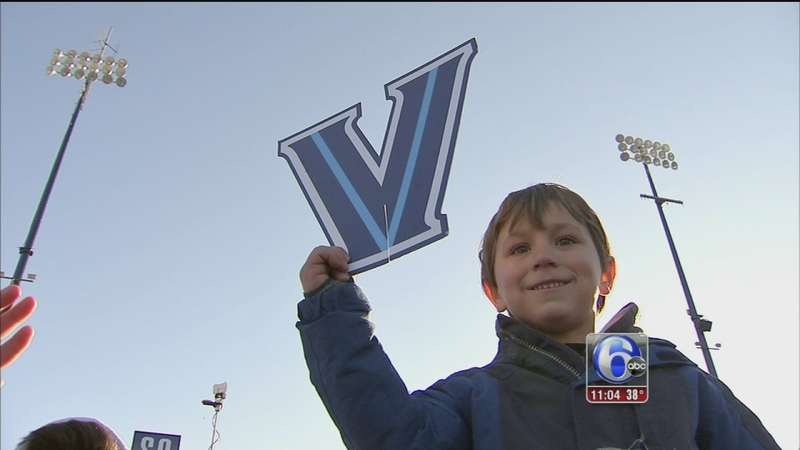 A huge homecoming greeted the Villanova Wildcats back to campus after a wild National Championship win in Houston and the team was grateful for the support. "The Nova Nation was louder than any team in that arena and you guys have done it for us all year," head coach Jay Wright said. The members of Nova Nation made themselves heard at the homecoming for the National Champion Wildcats. A crowd consisting of alumni, faculty, students, members of sports organizations, to name a few, cheered and chanted for Wright, Ryan Arcidiacono, Kris Jenkins, Daniel Ochefu, and the entire team at Villanova Stadium Tuesday afternoon. "Thank you for everything. 2016 National Champions," Arcidiacono said. The players took time to thank the fans who followed them throughout their championship journey. "I want to say thank you to all you who came out all year. You had our back and this is a great time I was fortunate to play with. I love these dudes. Go Cats, baby!" guard Phil Booth said. "It's great to be home, great to have the support of all you guys coming out this whole year. That's all I can really say. Go Cats!" guard Josh Hart said. "Thank you for coming out. Thank you for your support throughout the years. I couldn't ask for a better way to go out. On top. Nova Nation. 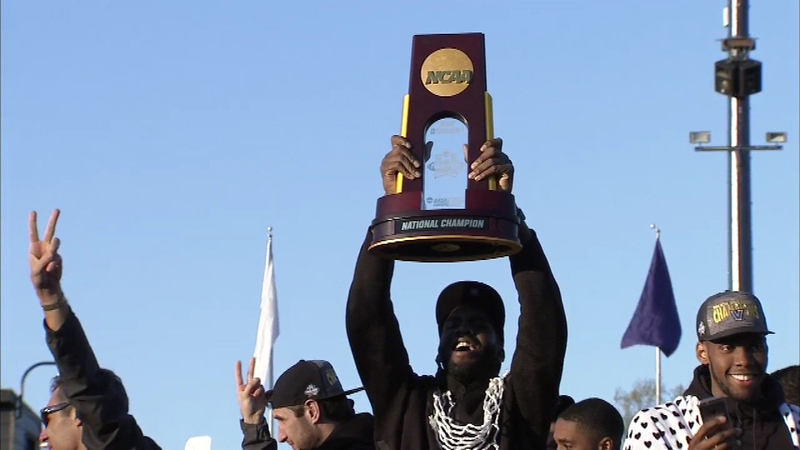 National Champions, baby," Ochefu. Villanova head coach Jay Wright speaks to Jamie Apody prior to the championship homecoming on campus. As he made his way to the field, Jay Wright stopped to talk with Action News sports reporter Jamie Apody. "This is awesome. I never even dreamed about this part. This part I never even thought about," Wright said. The 2016 National Champions made their way back to Philadelphia International Airport Tuesday after their 77-74 victory over North Carolina. "This is awesome. It's like you're walking on a cloud. It's especially nice to be back in Villanova, back in Philly," Wright said. The Villanova Wildcats have touched down in Philadelphia after their historic NCAA Championship win in Houston. Airport fire units created a water arch over the plane signaling the Wildcats home. Philadelphia International Airport fire units created a water arch over Villanova's plane as they arrived home after winning the National Championship. Prior to the team returning, a plane first arrived with alum and university officials including the Villanova University President Fr. Peter Donohue. "It is a wonderful opportunity for us to kind of show the world the kind of institution Villanova is and what we can do," Fr. Donohue said. A motorcade then led the players back to Villanova University for the homecoming celebration. The Villanova Wildcats show off their NCAA Championship trophy as they arrive at Philadelphia International Airport. Before star players Arcidiacono and Jenkins reached the massive crowd, they spoke to Action News. 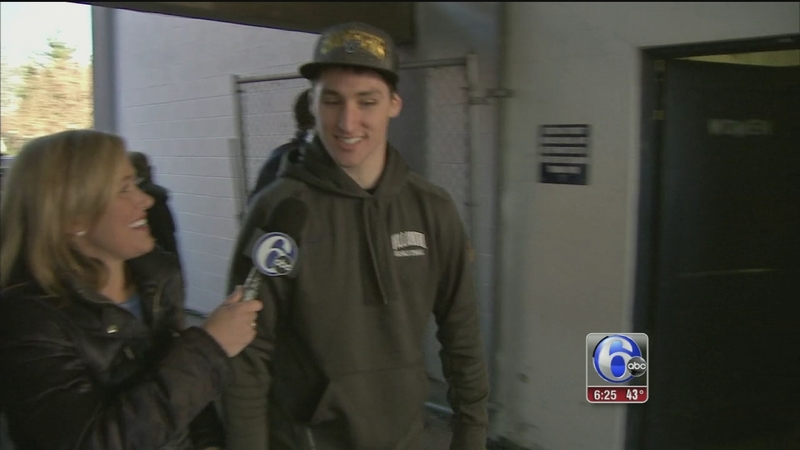 Ryan Arcidiacono and Kris Jenkins speak to Action News as they arrive for their championship homecoming on Villanova campus. "It's unbelievable. Nova Nation out in full force," Arcidiacono told Jamie. Jenkins, coming off his game winning buzzer-beater, could not believe what he was experiencing. "It's crazy. It's amazing. I'm just happy we were able to win," Jenkins said. As for his shot - he just had a quick statement on that. "It was a big shot," Jenkins said before entering the sea of Villanova supporters. Students attending the homecoming did not have to worry about missing a big test as classes were canceled for the day. The celebrations continue Friday when the City of Philadelphia hosts a parade for the Wildcats.